The second phase of Building for Our Faith Community capital campaign began in May this year moving grades 4 through 6 to the Garrigan campus after the completion of their building project. The removal of the former St. Cecelia Academy building and the 1959 addition was started this month. Our new parish center will be built on that site, connecting to the Rochleau Center and sharing a central kitchen. The building plans, shown below, include a large parish center, an updated kitchen accommodating school and parish functions, and a much-needed gathering space to use before and after liturgical celebrations and sacraments. A meeting room and an area for our Little Flames nursery are also part of the plans. A large parking lot will be situated just south of the new parish center. 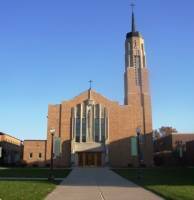 The broad support of the campaign by members of the parish is truly a testament to the dynamic faith that we support here at St. Cecelia. Thank you for supporting this campaign and helping us provide the opportunities, facilities, and access for all our parishioners to grow in their faith.